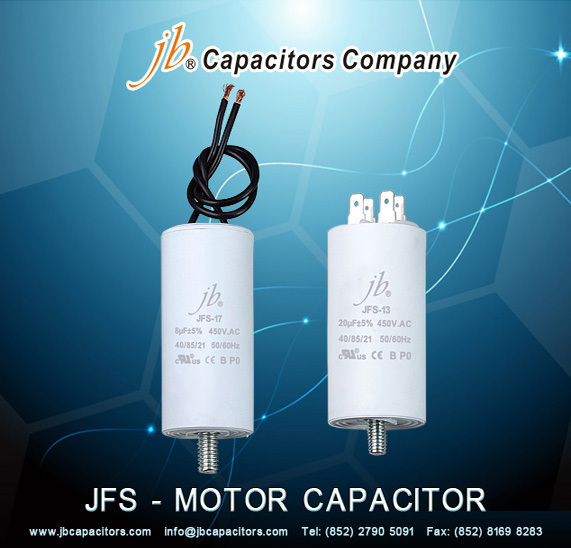 jb Capacitors manufactures Motor Starting Capacitor, also called Motor Run Capacitors. Motor Starting Capacitor is famous for low dissipation factor, lower temperature rise and high reliability and durability. We sell high quality and quite competitive prices for Motor Starting Capacitors, and totally we have 22 different series of motor starting capacitors. Following are Motor Starting Capacitor features. CBB60 Capacitor takes heavy-edge metallized Al/Zn PP film or web-like fuse film as dielectric. Its components are sealed with flame-retardant epoxy resin. It has cylindric outline with high reliability and stability. CBB60 capacitor has features of small size, light weight, small tangent in waste angle, and good self-concrescence. Applicable to startand operation with 50/60Hz. A. 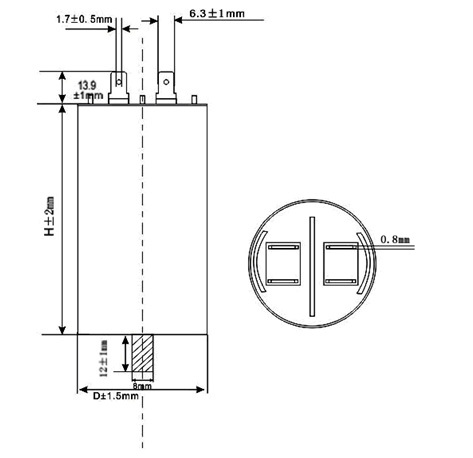 C single motor, specially suit for micro pump, baric pump, micro motor and so on. 1) Very small dissipation factor, small inheterent temperature rise. 5) Safety and hight reliability due to flame reatardant plastic or metal case enclosure, flame retardant opoxy resin endfill. 6) It is applicable for the starting and running of AC single-way motor with 50~60Hz frequency. 7) Special requirment can be made at the request of customers. jb Tells You What is CBB60 Stands for ? Part I: The letter represents the name, the meaning of C is a capacitor. Part II: with letters material. Part IV: The digital serial number. efficiency compressors of refrigerators etc. Feature and use : CBB60 Capacitors offer self-healing Metallized Polypropylene Film dielectric system, outstanding electrical characteristics, high capacitance stability over time and temperature, and very low internal power losses (Dissipation Factor). The CBB60 series is ideal for start and run applications in single-phase asynchronous motors and general A.C. applications at industrial frequencies. 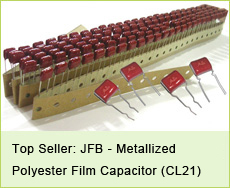 Applications : jb Capacitors Company CBB60 can be widely used as the start-up and running capacitor that is special for micro water pump, cleaning machine, washing machine, and single-phase water pump motor, etc. 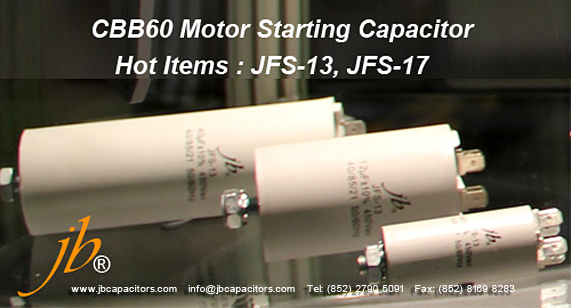 jb Capacitors Company produce CBB60 products. CBB60 is motor running capacitor or AC motor run capacitor, CBB60 motor running capacitor is non-inductively wound with metallized polypropylene film as the dielectric / electrode with encapsulated in a plastic/aluminium case sealed with epoxy resin. u Applied to the operation or running of 50Hz (60Hz) single-phase motor, such as washing machine, mini type electromotor. Here you can get an overview about our Successful Exhibition at Expo Electronica in Moscow 2013. Expo Electronica as an international exhibition for Embedded systems, Hybrid tchnologie, Sensors, Displays, Power Supplies, Passive Components, PCBs, Other Circuit carriers and EMS, Semiconductors, Electromechanics /System peripherals and Semiconductor light Emission Devices, gave us a great opportuntiy to present our products! Our JFV series have ENEC VDE UL approvals,very popular with the visitors, we got more and more requests after the exhibition, now the production extended much, support is much more better. 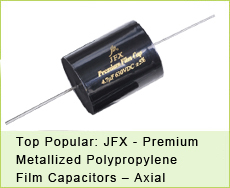 Currently our productivity of X2 film capacitors is 20KKpcs/Month. We invite any distributors of electronics components to cooperate together, and win more market shares of film capacitors. 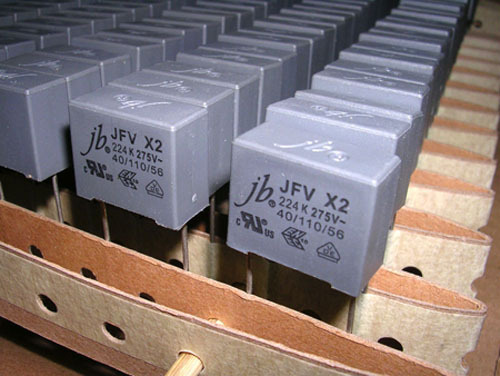 If you are looking for High quality, Good prices and Short delivery, please come to us jb capacitors, info@jbcapacitors.com . 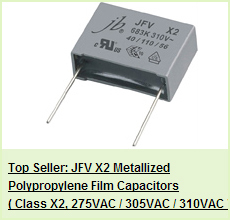 Below share with you our latest picture of JFV X2 metallized polypropylene film capacitor / JFV X2 safety capacitor / JFV X2 Condenser. We offer the best Bulk and Ammo package in China ! We offer low MOQ: 500~1,000 pcs with excellent performance, unbeatable price and good delivery. 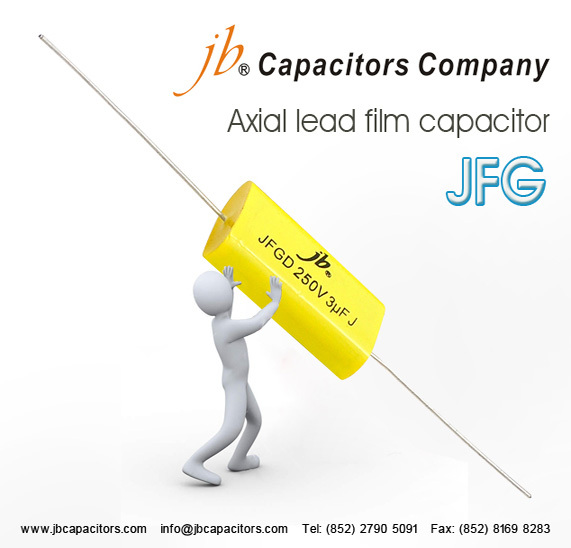 Kindly send your inquiry, let us quote for you info@jbcapacitors.com, ok? electricode, wrapped and sealed with flame-retardant plastic and epoxy resin. ★With high reliability, high temperature-resistance, small volume, large capacity and good self-healing property. ★Mainly used in instruments and the DC &AC circuit of the household equipment and the fractional frequency circuit of acoustics system.